Notice - The following is for informational purposes only. It is not intended for flight plans. Check the current Canada Flight Supplement for new information and updates. Yes. Except for a few weeks in March / April due to spring thaw. 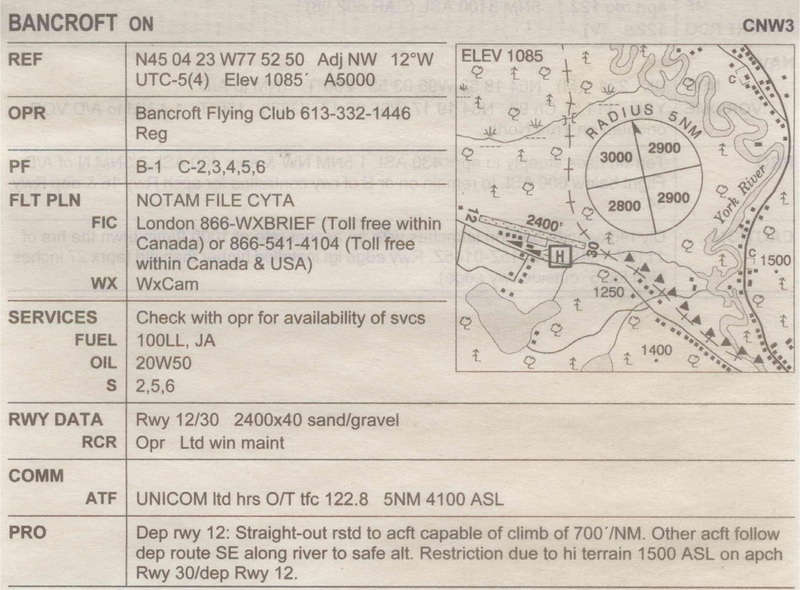 A NOTAM is issued when landing is restricted due to the spring thaw. Toll Free within Canada 1-866-WXBRIEF (1-866-992-7433). Toll Free within Canada and the USA 1-866-541-4104. 100LL and Jet A-1 available on call. Contact Gary Gaudreau (613) 332-6272. Mogas: Not available on field. CAUTION: Higher terrain all quadrants and especially on arrival to runway 30 and departure from runway 12. Restrictions due to high terrain 1,500’ ASL on approach to Runway 30 / departure Runway 12. When departing runway 12 aircraft capable of climbing 700 feet/nm can climb straight out, otherwise follow the river southeast to a safe altitude. FOR LIABILITY REASONS WE MUST CAUTION THAT ANYONE USING THE AIRPORT DOES SO ENTIRELY AT THEIR OWN RISK. Available just minutes away in the town of Bancroft you will find Taxi, Hospital, Police, Accommodations, Restaurants, Groceries, Drug Stores, Car Rental, Chamber of Commerce, Churches, Live Theatre and Shopping. Camping is allowed on airport property for aircraft flying in.